So how long do you keep your makeup products? Do you label them with the purchase date so you can monitor if it is time to toss it out? I know that I am guilty of keeping stuff way past the expiration point. I give the products the old sniff and smell test and if it doesn't cause the gag reflex to kick in then I'm keeping it. 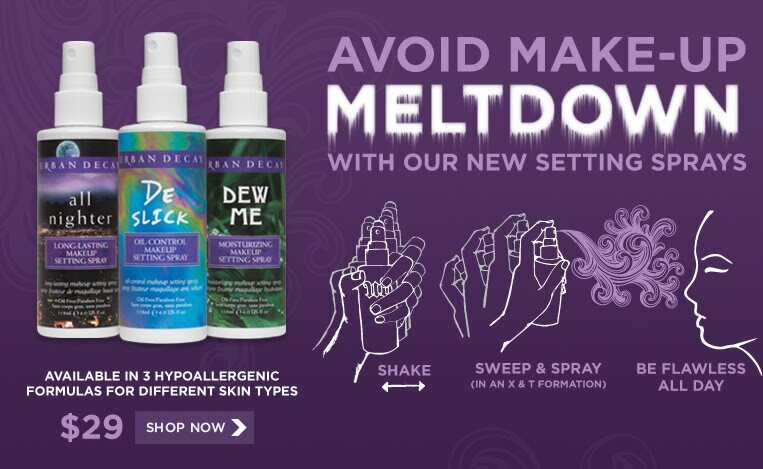 I know, I know, that is totally unsanitary but I adore that beautiful one of a kind ______________ (fill in the blank with your favorite product) to death and I'll never be able to duplicate it!!!! How many times have you thought that or heard one of your friends say that exact same thing? Admit it, we have all at one time or another thought that. Well, you need to get past it, cause your health is a lot more important than your favorite beauty product that is starting to wreck havoc on your face and should have been tossed ages ago. 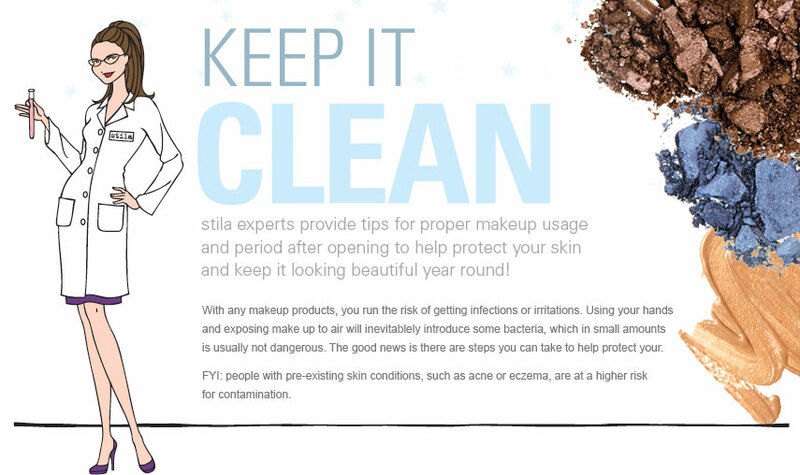 Read on as the Stila Experts weigh in and guide you step by step on what to keep and how long is too long. Wash your hands before putting on makeup to avoid the spread of bacteria. Wash brushes once a week. See cleaning methods below. Wash sponges once a week and discard monthly. For makeup items that you use on a daily basis, such as mascara, foundation, powder, and moisturizers, try and only open and use one at a time. Finish it completely before you open a new one. If makeup begins to change color, smell, separate or look off, you should throw it out. If you can't remember when you bought a piece of makeup, toss it. If you get an eye infection, stop using makeup for at least two weeks and toss all of your eye makeup. Don't use lip products if you develop a cold sore. Toss out any products that have been used on a cold sore to prevent spreading. Toss it if it changes color or begins to clump. Toss if changes color, separates, begins to smell off or dries up. Foundations with pumps will last longer. If the foundation bottle requires you to dab your fingers in it, it should be replaced every 6-8 months. For stick concealers, toss if it becomes dry and loses coverage. In general, stick concealers will last longer. Toss if changes color, separates, or begins to smell off. There is not as high of risk of infection with face makeup products; however, face products will become less effective over time. Try to avoid using your fingers to remove product from a container. Use a brush or spoon instead. 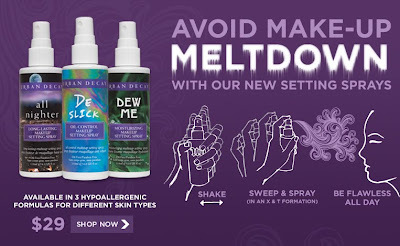 This will help prevent bacteria from entering the product. Apply either a small amount of mild shampoo, antibacterial soap or brush cleanser. Gently lather the brush and rinse under warm water until the water comes out clear and all makeup has been removed. Squeeze out the excess water in the brushes. Lay the brushes flat on a towel and allow them to air dry. 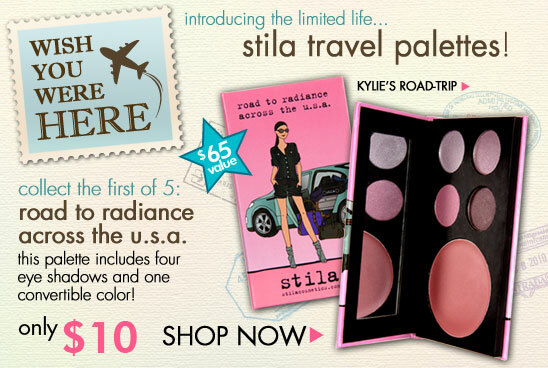 Introducing the limited edition Stila Girl Travel Palettes! Follow the five stila girls as they travel across the world and get five complete looks (launching each month through December). The first of the series is Road to Radiance Across the USA inspired by Kyley's road trip across the US! 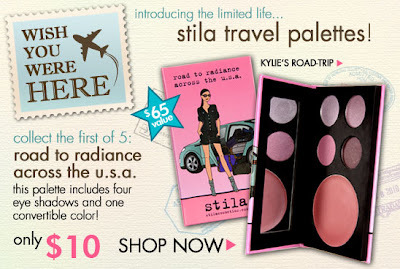 Be one of the FIRST to get it on stilacosmetics.com! What a great gift for Dads & Grads alike! 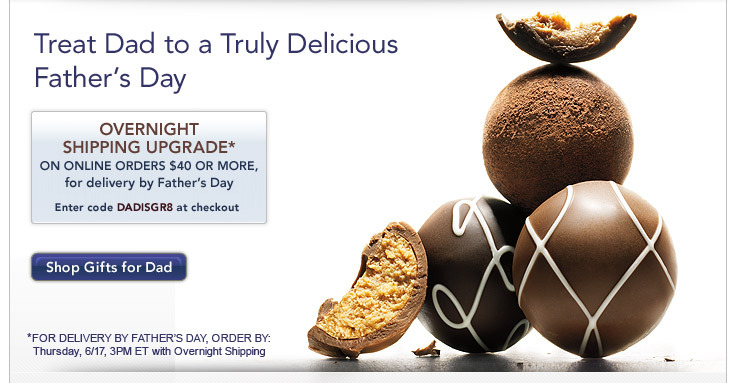 Surprise them with a yummy box of Godiva Chocolates to celebrate any occasion. Be sure to pick up an extra box for yourself; I know that I am! 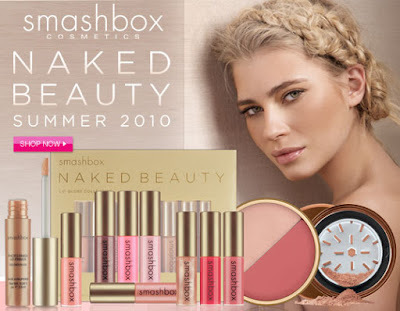 M•A•C Splurge or Steal? FREE OVERNIGHT SHIPPING WITH ANY PURCHASE. USE CODE STEAL. SEE DETAILS BELOW*. Splurge on some of these M·A·C favourites and enjoy their multi-tasking, long-wearing, time-saving, face-changing benefits. Paint Pot $16.50 Super highly pigmented, this eye colour has long-wearing and colour fast attributes. Double up under eye shadows for true staying power - no smearing or re-touching needed! Pigment $19.50 One pot of this M·A·C favourite will last you an age! A little goes a looong way for this rainbow of loose powders, plus it doesn't streak or cake. Mineralize Eye Shadow Duo $19.50 Do double duty with these duo's by using them wet or dry - go sheer when dry and then amp up the colour with a wet brush. Don't forget you're also getting 2 coordinating colours in one pan! Penultimate Eye Liner $16.50 A liquid, pen-style liner in a rich, deep, carbon-black shade - only one stroke required. Super long-lasting, its been proven to wear for up to 12 hours. Pro Longwear Lustre Lipcolour $21.00 This rich, lustrous, moisturizing 2-in-1 lipstick/topcoat doesn't smudge, run, transfer or feather - and provides up to eight hours of transfer-free wear. Replacement top coats are also available at a steal! Prep + Prime Line Filler $19.50 An anti-aging ally: a primer you can use post Foundation to relax lines and wrinkles. Plus who needs a face lift when in tests 78% of panelists saw increased firmness and 83% saw visible lifting of the skin. Enjoy them all with a true steal from M·A·C...FREE Overnight Shipping TODAY ONLY!